Head out of Nairobi past the JKIA airport and onto the main road that takes you to Mombasa. You go past Athi River, then Machakos Junction (left) and carry on the main Mombasa Road. After about 90 km (from Nairobi) you will come to a small town called SALAMA on top of a hill – this is after you have been through some hills where there are obvious climbing lanes on the road. It is a fairly obvious town, as many of the long-haul lorries stop off here and there are new speed bumps. 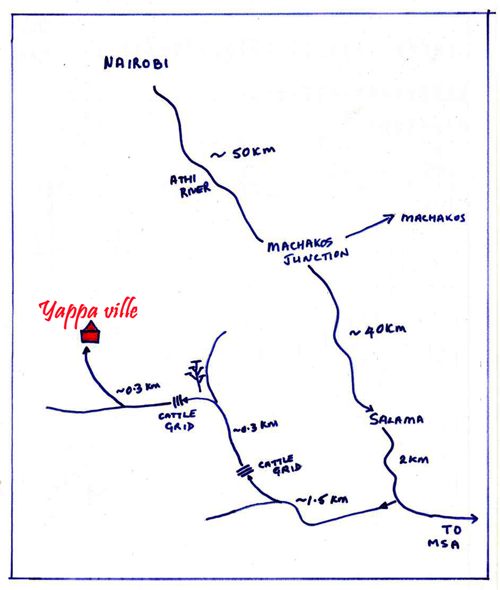 Carry on through Salama for about 2kms – you will be heading down the hill. Just before the bottom of the hill there is a small dirt road on the RIGHT – there is a RED Coca-Cola sign that says KIU DELIVERANCE CHURCH on it. Take this dirt road (you will have gone too far on the tarmac if the road takes another left bend and flattens out and the climbing lane runs out!!). Once on the dirt road, you will come to a fork approx. 1.5kms in. Take the RIGHT hand fork up over a cattle grid. At the top of this road there is another fork and a large acacia tree – take the LEFT hand fork over another cattle grid, and then follow the signs to 'OFFICE / KENNELS' (straight and then right up a hill just after a concrete brick building). There is a flat area for parking - please call when you reach here and we will come out to meet you. On a good day, with little traffic the trip takes about 2 hours max. Would you like to download our map?